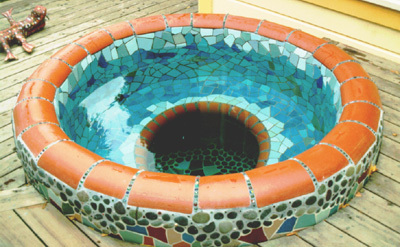 I designed and built this mosaic hot tub from the ground up in my backyard in downtown Santa Cruz. 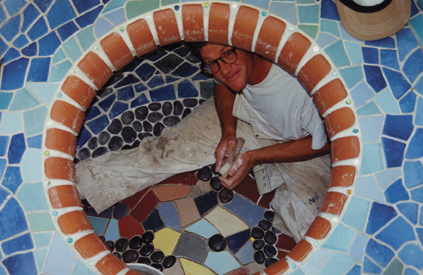 The hot tub was designed and initially built for a sculpture seminar class at UCSC in the early 90’s, taught by Rick Soss. The structure was built of steel and concrete block (thank you Jay Howe, Bruce Malley, and Barton Cline). It is 6′ deep, and features an ergonomically-engineered, cantilevered seat, making it possible to submerge oneself into the cavern beneath the seat. Monumental art is cool (no, hot). This entry was posted on January 30, 2013 by dori. It was filed under Uncategorized .